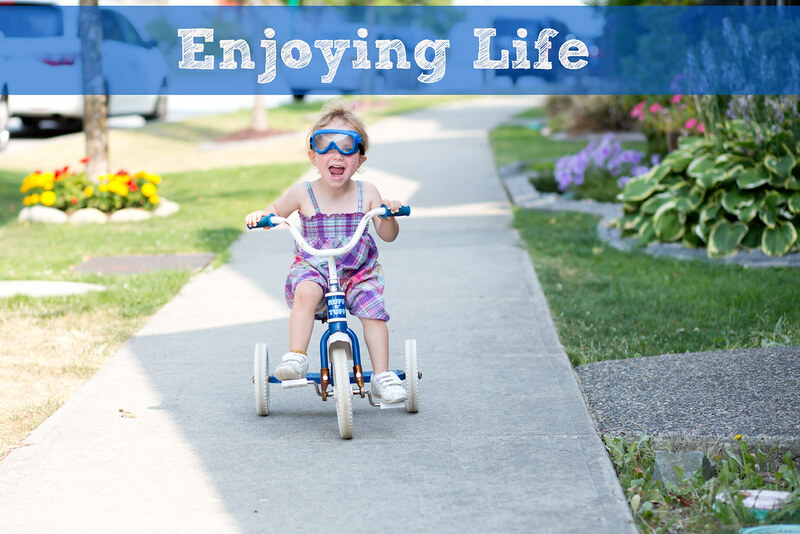 What three things prevent us from enjoying the lives we have? 1. Worry. I tend to be a worrier. I easily think of all the `what ifs' way more than I should. Gary has said, `Just don't worry about it' but it's hard to tell someone not to feel how they feel. I have definitely gotten better over time as I've learned that I only have so much control over what happens in life. Worry does NOTHING to help the problem you may be having and actually makes it worse. This comes back to a verse that changed my life, `Trust in the Lord with all your heart and lean not on your own undesrtanding'. Proverbs 3:5. 2. Regret and Guilt. Thankfully I don't live with much regret and guilt because I've asked for forgiveness from those I've hurt (as far as I know!) and God. Yes, I've made some (oh, maybe more than some) dumb decisions but it's left in the past. On that note, I'm so thankful that there was no social media when I was a teenager. I'm just imagining all the terrible things that would've been documented on the world wide web. I'm a pretty responsible and smart girl but I really did a lot of things that could have turned bad quickly. 3. Dissatisfaction with what we've been given. I've always been thankful for what I have but growing up I was very dissatisfied with how I looked (mostly my weight which was totally fine but I didn't think so). I'm so thankful that it is not much of a struggle in my life anymore. I can still compare myself to others at times which I know is dangerous. `She had three kids too and look at how beautiful and fit she is!' `Their photography is waaaay better than mine!' `How did she get so many followers on twitter/instagram/facebook...' `Oh I wish I had as much free time as they do!'. Silly things, I know. I am very thankful for everything that God has given me and I think that my Thankful Thursdays really help to keep my mind on track. Comparison is the thief of joy - Theodore Roosevelt. We live in an instant gratification society and I constantly reflect on this as I parent. Making Kai wait months and months to get his Skylanders was a good idea. Having them save up for Disneyland pop bottle by pop bottle is also good. We have set `treat times' at 10 am and 2 pm (Nya can be heard yelling `10 o'clock treat time!' all throughout the day) so they know that they have to wait. It feels so good to see your kids happy but it's so important to teach them to be patient. If you aren't so sure about God, I'd totally encourage you to look into it. It won't hurt. It is THE most foundational thing in my life that determines how I view the world. If you do believe, but are feeling jealous or dissatisfied or worried, I would encourage you to remember Who is in charge, think of the big picture, and to look for the blessings in your life. And, if you want to see a recent example of this, here is a 3 minute video (of a 10 minute plane ride) that shows me enjoying life and trying not to worry. Gary put the `Top Gun' music to it, not me. PS I'm not sure how to address this but I know that those who struggle with mental illness may know these things but can't apply them because of the illness. I get it, as much as I can. I have some very close friends going through this. And for those, more than just `perspective' is needed, and I highly recommend getting help as my friends have done. Oh yes, don't be afraid to leave a comment! This is a great post, Louise. I read all three of those elements and thought of the times very recently that I've faltered in my quest to be 'just happy' because of guilt or worry or comparison. Also - LOVE the video. so cool! Happy birthday on Thursday and enjoy your dream date! Some very much needed reminders. That sermon and your words were just what I needed this week. Thanks Louise! And I love your enthusiasm in the video :) Have an amazing time tomorrow! loved the video, and can't wait to hear about the dream date!! !